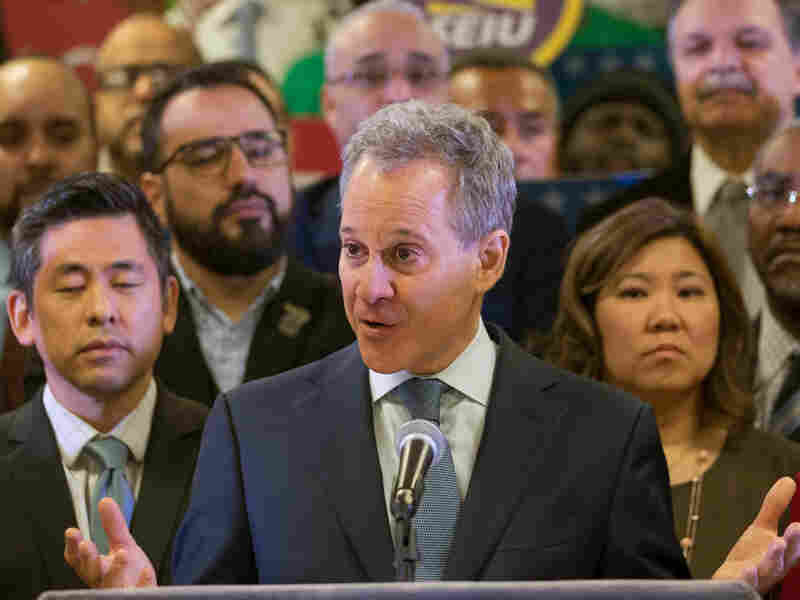 N.Y. Attorney General Resigns After 4 Women Allege Physical Attacks : The Two-Way The New Yorker reports the women, with whom Schneiderman had romantic relationships, say he physically abused them. Schneiderman denies the accusations but says they prevent him from doing his work. New York Attorney General Eric Schneiderman is resigning amid allegations that he physically abused four women with whom he was in relationships. New York Attorney General Eric Schneiderman, a vocal critic of President Trump who has championed many women's causes, has resigned following a New Yorker article that detailed allegations by four women that he physically abused them. "In the last several hours, serious allegations, which I strongly contest, have been made against me," he said in a statement. "While these allegations are unrelated to my professional conduct or the operations of the office, they will effectively prevent me from leading the office's work at this critical time." The New Yorker reported Monday that Schneiderman had been accused by the women "with whom he has had romantic relationships or encounters." Schneiderman's office released a statement from his former wife, Jennifer Cunningham, who said she had known him "for nearly 35 years as a husband, father and friend." "These allegations are completely inconsistent with the man I know, who has always been someone of the highest character, outstanding values and a loving father. I find it impossible to believe these allegations are true," Cunningham said. Two of his accusers, Michelle Manning Barish and Tanya Selvaratnam, are named in the story. The magazine says it has vetted the comments of a "third former romantic partner" who told Manning Barish and Selvaratnam about similar incidents but didn't want to talk to The New Yorker. The magazine talked to a fourth woman who accused Schneiderman but did not want to be identified in the article. Following the publication of the story, Manning Barish wrote on Twitter: "After the most difficult month of my life-I spoke up. For my daughter and for all women. I could not remain silent and encourage other women to be brave for me. I could not..."
The story quotes the women as alleging that Schneiderman often slapped them hard enough to make their ears ring and, in one woman's case, make her ear bleed. They also say he tore down their self-esteem with the attacks, as well as with verbal abuse. Manning Barish alleges that the first physical assault came after she and Schneiderman had been dating for four weeks. She tells the magazine that he slapped her "with great force ... out of nowhere" as they prepared to go to bed. She says he also choked her. When she fought back and managed to free herself, she says, he accused her of scratching him and said "hitting an officer of the law is a felony." Manning Barish left and returned to Schneiderman several times over the course of more than a year, according to what she told The New Yorker, although the violence continued. She links the abuse to drinking, as does the other woman named in the story, Selvaratnam, who says she also stayed in a relationship with Schneiderman for more than a year. Selvaratnam, who was born in Sri Lanka, says Schneiderman called her "brown slave" and made her say that she was his "property." She says he threatened more than once to kill her if she left him, although she didn't know whether to take the threats literally. She told the magazine, "He also told me he could have me followed and could tap my phone." The New Yorker says that both women told other people about the attacks during the relationships and that those people have confirmed the details.